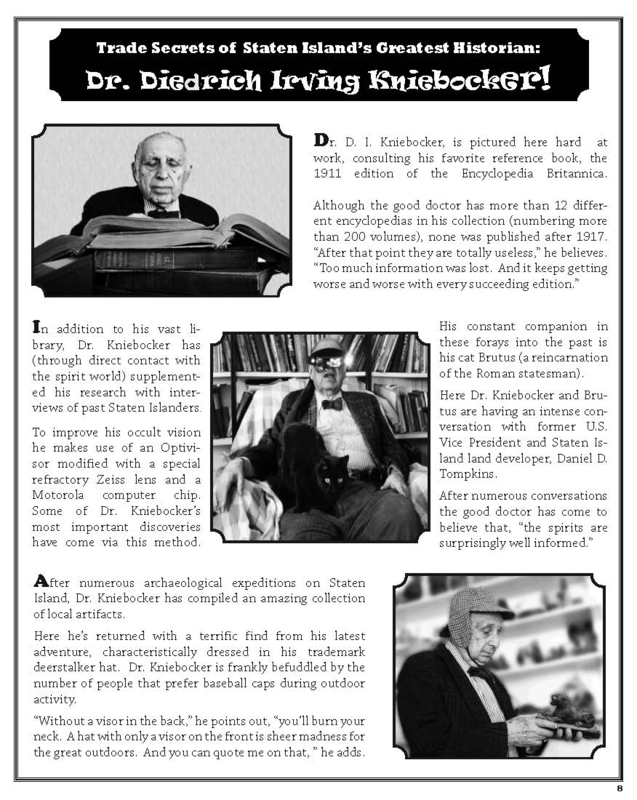 The Story Behind the Truly Amazing Dr. Diedrich Irving Kniebocker! Since I wrote about trying to get a grant for the Forgotten History of Staten Island, yesterday, it seems logical to explain what the whole thing was about. The piece was about the malleability and unreliability of history. Rather than being set in stone, history changes constantly. People contantly reinterpret events, and events that never happened often become part of the accepted narrative. However, I wasn’t trying to debunk recorded history. I wanted to get viewers to read history with the same amount of enthusiasm and skepticism that I do. I worked for many years as a library researcher. It was the nature of my work that I got all kinds of different assignments. Many of them were quite boring; looking through the masthead of issues of a Woman’s Magazine for a trademark violation, or whatever. But historical jobs were always interesting, often because of what was found inadvertently. Old newspapers are spellbinding. The writing in papers from the early days of the 20th Century is incredibly vivid and the layouts of special sections are absolutely off the wall. Newspaper stories from 75 or a 100 years ago, having strikingly little to do with current perceptions of that period. Instead, they are full of things one wouldn’t even contemplate. For example, I remember reading in a turn of the century New York Tribune about a Jewish Congregation in Upstate New York that was being interviewed in regards to a missing child during the Passover season. Apparently, it was a standard thing, due to the concerns about human sacrifice during the holiday. Equally improbable, though less disturbing, I found out that polo matches in that era regularly attracted crowds of 50,000 + people to Long Island, NY, when the US team played England. (That’s about 10 times the attendance of a major league baseball game at the turn of the century.) Gradually I began to develop a view that history is formed by selecting certain facts (or fictions) and grafting them on to a view of the past that suits contemporary society. As such, history changes with the times. When I lived on Staten Island, I saw this process in action. There was a perception of the past there that parallels the Norse myth of Ragnarok, where Frost Giants cross the Rainbow Bridge and ravage Asgard. In the Staten Island version, a horde crosses the Verrazano Bridge from Brooklyn and pretty much does the same. Although in contrast to the Norse story, no new Gods emerge and everything is ruined forever. There’s a lot of truth in the Staten Island story. Sprawl, terrible development, traffic congestion, etc, occurred after the bridge was built. But there is also a lot of fiction. Most Staten Islanders believe that an urban area never existed there, and yet the downtown Staten Island area (where the ferry docks) is decidedly urban and over a hundred years old. When you are trying to convey unreliability, nothing works better then the well-worn concept of the unreliable narrator, in this case Dr. Diedrich Irving Kniebocker. I thought the name would work as a clue, as it is an amalgam of Diedrich Knickerbocker (the fictional author of the 1809 bestseller History of New York), and the actual author of that book, Washington Irving. Like Dr. Kniebocker, the fictional Mr. Knickerbocker was a bit of a recluse; and like myself, Washington Irving was consciously making a statement about the unreliability of history when he wrote his History of New York. No one however (to my knowledge) ever got the clue. I portrayed Dr. Kniebocker at the opening of The Forgotten History project (at Snug Harbor). The project then took the form of a series of outdoor installations around Staten Island. But I felt like I needed someone who actually looked the part for the printed material, so l asked my father to pose for me. It hasn’t always been smooth sailing between us, but he helped me out big time, here. So thanks, Pop. If anyone is qualified to write The Forgot­ten History of Staten Island, it would be Dr. Diedrich Irving Kniebocker (known to his friends as “D.I.”). Dr. Kniebocker was born on Todt Hill in the back room of The Eagle’s Rest, the highest tavern south of Maine on the Eastern Seaboard. During prohibition, as his family abandoned the saloon business in favor of used books, he lived there in the back of The Open Book, the highest antiquarian bookstore on the East­ern Seaboard, south of Maine and it was then that Dr. Kniebocker developed his life­long love of history. After his graduation from medical school, Dr. Kniebocker was renowned through­out Staten Island for starting the highest phrenology practice south of Maine on the Eastern Seaboard. However, upon winning the Irish Sweepstakes in 1953, Dr. Kniebocker aban­doned his medical practice to move to an undisclosed location and begin the grand enterprise that would sustain him until this day — the writ­ing of his epic tome, The Forgotten His­tory Of Staten Island. BTW, if you want to see a full screen of the “Trade Secret” page at the top, just give it a mouse click.